We woke early to darkness and silence. It was 6 am yet no other guests were up and there were no yaks grunting or bell-jingling of a passing mule train to break the silence. It was time to go to the airport and pray the planes were flying. It wasn’t that I didn’t like Jomson. 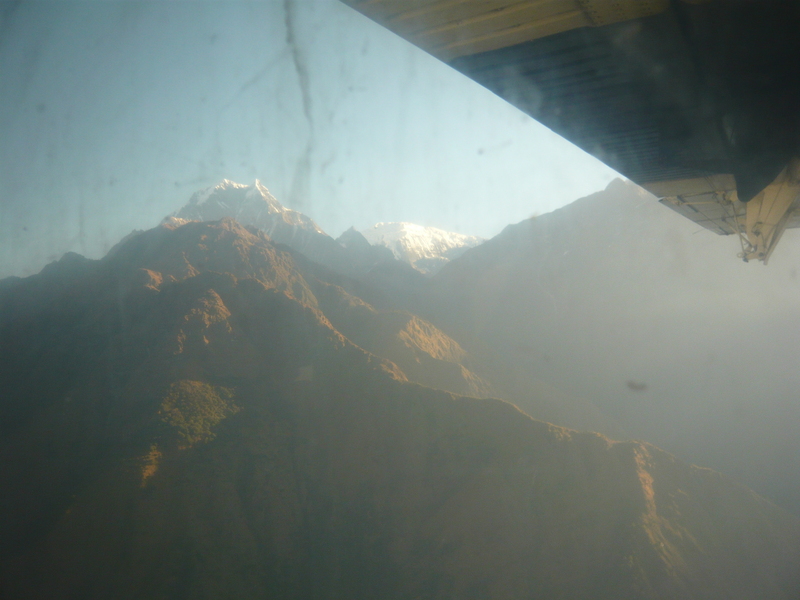 I was just ready to move ahead to Pokhara…beautiful, dreamlike heaven. I had heard from many that Pokhara is a special place, the Shangri-La of Nepal. Gorgeous mountain views of the Annapurna range in all their glory reflect across the aquamarine Phewa Tal lake. 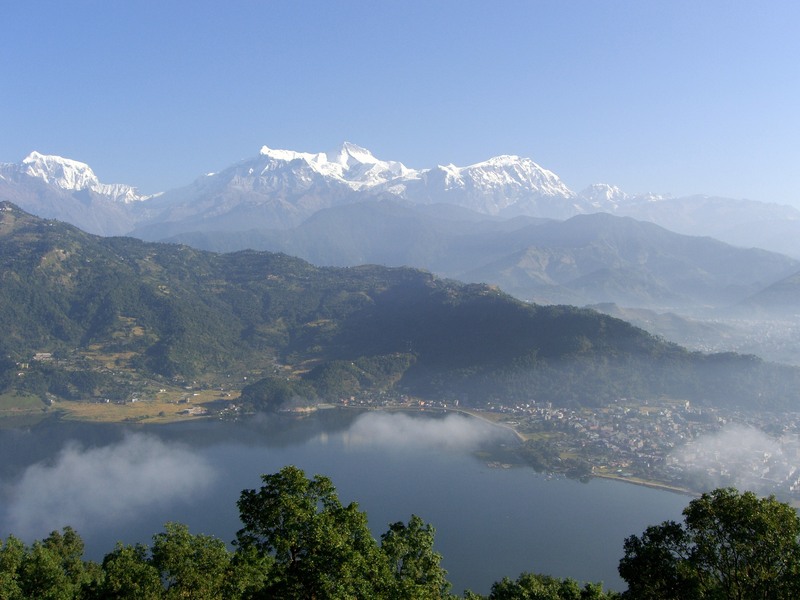 Besides Pokhara’s serene setting and beauty, Pokhara is also known as a more laid-back Thamel (the touristy, shopping district of Kathmandu) and offers the visitor an array of shopping, dining and adventure-seeking sports. I couldn’t wait to get there. Initially we had only planned on flying through Pokhara but due to a few back-to-back days of extra hiking we were able to land an extra day into our tight schedule and looked forward to enjoying it in Pokhara with our friends Hari and Chrring. The airport experience was frightening. A large group of trekkers were lined outside the gates at ten to seven with weary, tired looks on their face. The machine-gun clod airport security guarded the small airport doors with looks of superiority and boredom. Finally, at seven am the doors opened and the hordes filed inside. There was no rhyme or reason to the ticket lines: Just lots of budding in line, pushing and shoving. Hari, whose miraculous guiding expertise, saved the day once again and got us the last four tickets on the flight. Next we headed to the “women’s” and “men’s” lines for our pat-downs. Each passenger went through a private room, where their entire body got a check for weapons. It was funny because there was so much fuss back at home in the US about the detested pat-downs and how it invaded privacy and personal rights. Yet pat-downs are just a fact of life traveling in Nepal and India. At any airport, you have at least two of them (in Dehli, even three!). It never bothered me one bit and instead, made me feel much more secure. I found through my travels that security is on an entirely different level. Bags and luggage is hand-checked, smelled and tested. Pat-downs are fierce, and the intimidating guns are there to remind you to stay in line. You can’t even enter the Dehli airport without a printing out boarding pass. The security is so intense that there are dudes with enormous guns waiting outside every single door into the airport. No ticket, no entrance. 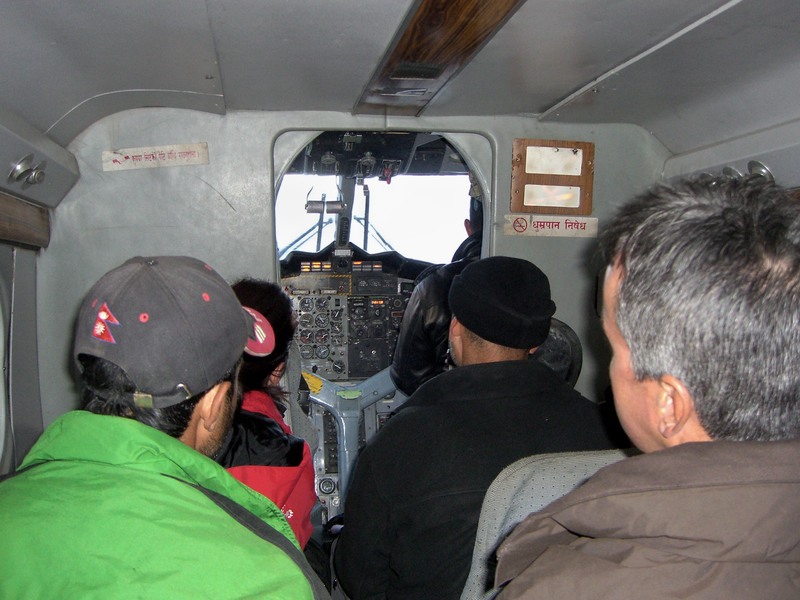 We boarded the small, 14-person aircraft with elation and fear. I detest small planes and was nervous about this flight even before I left the States (see earlier post: Is it Safe?). The plane was old and you could barely stand up inside. I held my Buddhist prayer beads tightly and tried to relax. Hari found my nervousness humorous and tried to make me laugh. The engines revved up, my heart fluttered and my palms were soaking wet. Then we started to go, not fast, not slow, down the runway and gently lifted into the sky. The plane flew at an alarmingly low altitude (Only 10,000 feet!) which felt so strange after hiking ABOVE that altitude for days. You had to crane your neck to see the mighty mountains soaring above you 15,000 feet up into the sky. 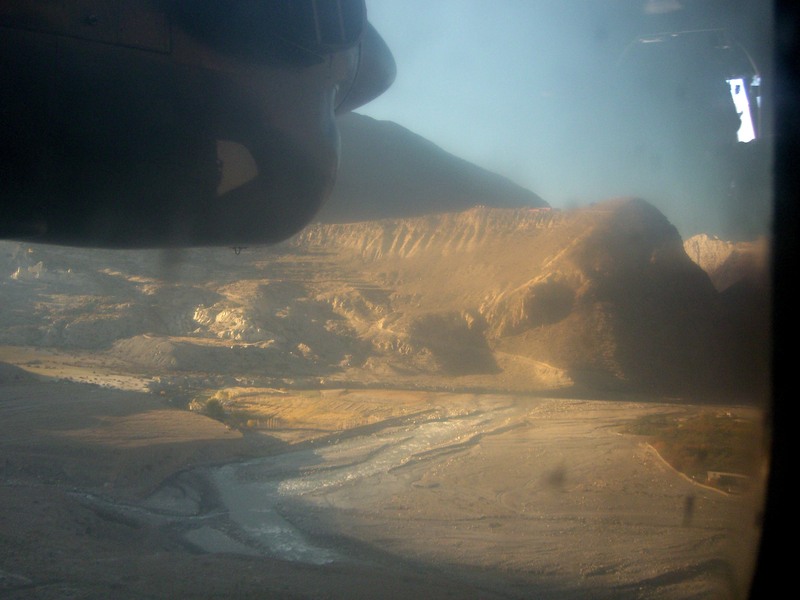 I tried not to look at how close we were to the rocky sides of the mountains or how the plane barely made it over the trees. I squeezed the beads tightly yet marveled how much the flight reminded me of a scene in an Indiana Jones movie (for those readers who are not as old as me, Indiana Jones is an adventurer whose first big movie was a hit in 1981 called Raiders of the Lost Ark). Alas, we saw the gorgeous green, terraced rice fields and the outline of a town tucked away at the base of the mountains. 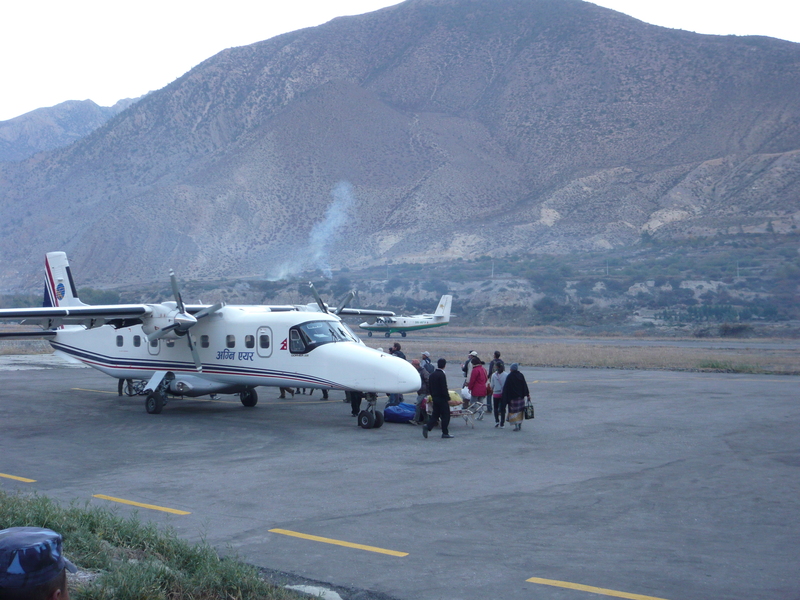 It was Pokhara and we landed safe and sound into the hot, bright sun once again. I finally let go of my prayer beads yet did not take them off until I arrived safely at home in Minnesota several days later. I still needed them for surviving the drive of terror in India! That will come later! 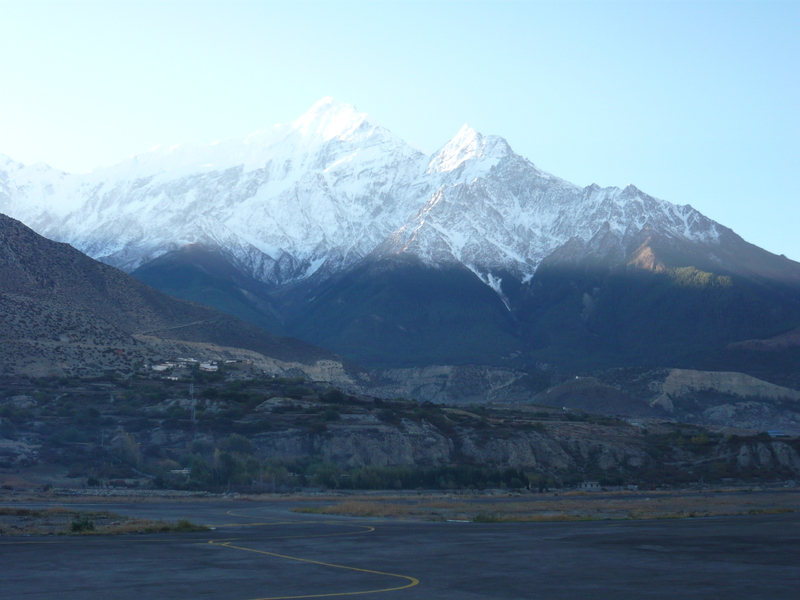 For now, here are some lovely shots of the flight and beautiful, serene Pokhara. The views outside the window….